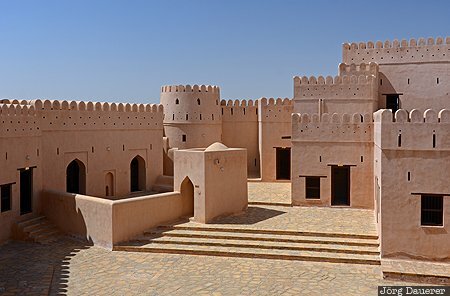 The Architecture of the Jalan Bani Bu Hassan castle in village of Bani Bu Hassan. Bani Bu Hassan is in the Ash Sharqiyah Region in the east of the Sultanate of Oman. This photo was taken in the early afternoon of a sunny day in March of 2012 This photo was taken with a digital camera.